The UK economy is close to regaining its pre-financial crisis level of economic activity, according to research organisation NIESR. Economic output at the end of April was just 0.17% below its pre-recession peak, it said. 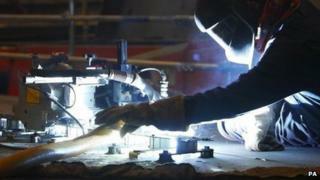 Separately, official figures showed strong growth among manufacturers. Manufacturing output grew by 1.4% in the first quarter of the year, the strongest pace since 2010, the Office for National Statistics (ONS) said. The National Institute of Economic and Social Research (NIESR) said it expected GDP to regain its first quarter 2008 level within a short time scale. The UK is nearly, but not quite there, according to these estimates. When Britain gets back to the peak level of economic activity of the first quarter of 2008, it will be a landmark in the post-financial crisis rehabilitation. It has taken a long time, longer than some of Britain's competitors. Among the G7 leading developed economies the United States, Germany and Canada got to pre-crisis levels about three years ago. France managed it, just, at the end of 2013. Japan is expected to have done it too in figures for the first quarter of this year which are due next week. Italy however languishes far below the levels of 2008. The eurozone as a whole is also still adrift. That reflects Italy's weakness as well as the other crisis countries, but the Netherlands and Finland are also still below the levels of activity they reached before the crisis. Later this year, the comparisons will be kinder to Britain, if as widely forecast, the economy chalks up the fastest growth in the G7. "It can reasonably be expected that the peak will be regained within the next month or so," NIESR said. Separately, NIESR upgraded its growth forecast for the UK economy to 2.9% in 2014, from an earlier estimate of 2.5%. It increased its growth estimate for 2015 to 2.4% from 2.1%, and sees growth remaining at about 2.4% for the following two years. The better-than-expected rise in manufacturing output was mainly driven by rubber and plastics, which grew by 7.3%, ONS figures showed. Food, beverages and tobacco, and machinery and equipment also drove growth. The largest downward pressure came from pharmaceuticals, which fell by 5.8%. Martin Beck, senior economic adviser to the EY ITEM Club, said: "The 'march of the makers' continues." He noted that given recent upbeat manufacturing surveys in April, the second quarter of the year seemed "set fair for further strong growth in the manufacturing sector". In addition to the manufacturing data, separate figures from the ONS showed that output in the construction sector grew by 0.6% from the previous quarter. The ONS also said that the UK trade deficit fell to £1.3bn in March. The fall in March's trade deficit was driven by a rise in exports, with exports of goods up 4.9% from the month before while imports of goods rose 2.8%. However, David Kern, chief economist at the British Chambers of Commerce noted that while the monthly figure had seen a big improvement, the trade deficit for the first quarter of 2014 had narrowed only slightly compared with the previous quarter. "While there are signs of a small improvement in the UK's international trade performance over time, the pace of change is still painfully slow," Mr Kern said. Nevertheless, the ONS figures suggest that the health of the economy is improving, BNP Paribas UK economist David Tinsley told the BBC. "The quarterly figures for industrial production, particularly manufacturing, suggest the economic upswing is continuing, if not accelerating," Mr Tinsley said. "This is a recovery not just based on the consumer. Manufacturing is powering ahead too."